In honor of Spokane’s Bigfoot sighting, http://www.inlander.com/spokane/blog-3342-video-spokane-river-bigfoot-sighting_.html, I’m putting this June 9, 2010 post on the front page for a bit. It details my own experience with Bigfoot. When I was a kid, there was an amusement park at Point Defiance in Tacoma called Never Never Land. It was a gathering of fiberglass and plywood fairy tale characters posed playfully among the evergreens. At the park’s entrance, a giant Humpty Dumpty atop a stack of books waved hello to a stream of guests. Once in awhile someone would kidnap Humpty Dumpty and the police would find him perched precariously on a cliff overlooking the Narrows Bridge. This park didn’t have mechanized rides or big-name celebrity branding, but it was a thrill to see our bedtime stories come to life. Things were kid-sized and every vignette was familiar. My favorite part of Never Never Land may have been the Peter Peter Pumpkin Eater house, where we could pose next to Peter’s strangely contented wife in the window. One day when I was in first grade, my family went to the doctor for routine vaccinations. Back then the needles the doctors used were the size of drinking straws, and shots hurt so much that I would refuse to move my arm after getting them. So my parents would put my arm in a sling made from a pillowcase, knowing that it would be a couple of days before I dared move the offended arm again. After surviving the mandatory doctor’s office visit, we went to Never Never Land. Yay! It had a slide that seemed a hundred feet tall and made you feel like you were on top of the world at its pinnacle. I call it the Old Mother Hubbard slide, but Mother Hubbard was the one with the dog who could read, write, and play the flute. I think the slide was supposed to be a nod to the Old Woman Who Lived in a Shoe. You know, the one who needed to have CPS called on her along with ongoing mental health counseling. Anyway, this slide was a large raincoat-yellow boot with a brick-red shed on top. Frozen arm in a sling, I got in line with other kids and gingerly pulled my way up the steps to the summit. At this point in my life, I was checking out books from the library on UFOs, ghosts, and cryptozoology. I often stayed up late reading in bed and then wrapped my blankets tightly around my feet in case some space alien decided to pop out of the closet and touch my toes. When you’re in elementary school, it’s not such a stretch to imagine that a stinky green humanoid might travel all the way here from Mars to manipulate your metatarsals while you’re sleeping. Because of my literary choices, I was well aware of the creatures rumored to be living in the Pacific Northwest woods I grew up playing in. We have quite a menagerie of legendary beings around here. So you can imagine my horror when I looked out the shed at the top of the slide the moment some jerk dressed like Bigfoot walked out of the woods. THUNK! My injured arm smacked against the side of the slide and I wanted to scream because it hurt so much. Paralyzed with terror, I watched Sasquatch saunter by, casually surveying all of his potential mid-morning snacks. His gray, matted fur stuck out in clumps and I couldn’t get a clear view of his face, so I couldn’t tell if he was looking at me. I couldn’t move. I wanted to cry. Where was everyone else? Why were most other people acting like it was normal for a large, hairy, giant ape to be strolling through a crowded theme park? Why were kids still pushing at me to go down the slide? If I returned to terra firma, Bigfoot would maul us all. It was terrifying, and I wasn’t about to surrender my good arm to an unpredictable, bloodthirsty primate. Last I’d checked, Bigfoot wasn’t mentioned in any stories from Hans Christian Andersen or the Brothers Grimm. Bigfoot didn’t sleep on a bunch of mattresses on top of a pea, sell anyone pies, or run up a clock. There were no tuffets, candlesticks, or plums on thumbs in the Sasquatch lore. Bigfoot was a shadowy, enigmatic figure who few had ever seen and everyone feared. Yet there he was, making his way across a clearing full of happy children reveling in make-believe. What on earth was Bigfoot doing in Never Never Land? At some point I’m sure that I got down the slide and found my way to a nearby adult with a bullwhip or a machete. We didn’t have 911 in those days. I honestly don’t remember much about what happened next, just that I probably didn’t want to play in the woods for awhile after that. Then what kind of weirdo dresses up in a Bigfoot costume and walks through the woods into a children’s amusement park?!! The Big Bad Wolf wore pants. The Three Bears were preoccupied with chasing Goldilocks out of their house around the bend. Grizzly Adams didn’t live in Washington State, and I figured that Cha-Ka was going to college in L.A. by then. What other characters were over six feet tall and furry? Lumber, lumber, thumping, big gray ape. In reality, I don’t think Bigfoot is murderous or hungry for flesh. We fear what we don’t understand, so we make them into something they’re not. If they’re real, they’re probably very much like the supporting cast of Frank Peretti’s novel Monster and have the intelligence to stay away from us crazy humans most of the time. But who, or what, did I see that day? If you had a similar experience at Never Never Land, please feel free to share. To this day I am mystified by this experience. It would be nice to have a rational explanation as to why Bigfoot, or a closely related cousin, was in Never Never Land that day. Sadly, vandals did a great deal of damage to Never Never Land, and most of its characters now spend their days in a dark basement watching Price is Right reruns. I hope that what can be preserved of Never Never Land will be restored and put on display for future generations to enjoy. There was a happiness and an innocence in that place that generally doesn’t exist in children’s entertainment today. If nothing else, I’d like to build a replica of the giant pumpkin for my own backyard. Because I can. Update: As of January 2013, some of the Never Never Land figures will be sold through an antiques store. See http://www.weeklyvolcano.com/mudroom/features/2012/12/never-never-land-figurines-for-sale-at-broadways-best-in-tacoma/ and http://www.broadwaysbestantiques.com/FindUs.htm. What a shame to split these up. They belong in a museum. I’ve contacted several locally to see if they’re interested. 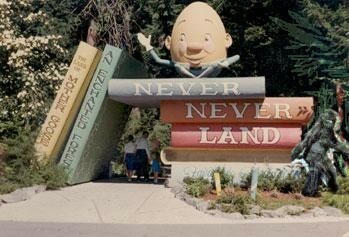 To see an interesting Never Never Land photo taken around 1980, supplied by East Coast Girl, check out this newer post. Maybe you know the story behind the mystery tree: https://wildninja.wordpress.com/2012/06/28/hamadryads-in-nnl/. This is so wild! The thumbnail photo made me laugh and now my little brother is convinced of Bigfoots existence after reading this to him lol. Thanks for showing me this! My fiance used to work at Never Never Land. He has not lived in Washington for several years, but when we met he told me he would take me to see NNL one day. He was sad to find out that it is no longer in existence. It sounds like a loss for many adults and now the children of Tacoma. I read in one of the posts that some of the figures are being sold. Does anyone have any idea of where I could possibly purchase one or more for a wedding present for my fiance? Any help would be greatly appreciated. Thank you. Thanks for stopping by! What a bummer that you weren’t able to see Never Never Land when it was open. It was just good, clean fun. Broadway’s Best Antiques in Tacoma is who was selling many of the figurines, http://www.broadwaysbestantiques.com/. I know that the Tacoma Parks Department still has some in their possession as well but they’re not selling theirs. What a unique and thoughtful gift– that is so cool! Let me know if you have any luck purchasing one. I’d be curious to know which one got such a good home. All looks good. Glad and excited too! To further note, I found a web site called The Bigfoot Researchers Org. (not sure I’m allowed to add a link) that has a very interesting article(s) called Pre-Columbian and early American legends. Perhaps the ancients carved the faces on the tree? Oh, feel free to add a link. I know an expert woodcarver who specializes in Northwest tribal art, and can say those are definitely not done in those style nor could they be that old. It would be nice to find out who’s responsible though… guess we could ask the Tacoma Parks Department. At the risk of making this post too long, I just started a new post and posted the link to it at the end of this article: https://wildninja.wordpress.com/2012/06/28/hamadryads-in-nnl/. I put a copyright notice on both the edited version of the photo and the original so people know they’re yours. Please let me know if any part of this isn’t okay– it’s your picture. I’m just so glad that you shared it! Image of woodland elves w/creepy faces. That’s wild! They’re clearly faces carved in the wood or fastened to the wood. I wonder if they’re still there. It would be interesting to see if anyone else remembers these. I don’t, or maybe I never noticed them either. Thanks for sharing. If it’s okay to post this as an addendum to my blog post, and put text on the photo that it’s copyrighted to you, let me know. Ok. Let me know what you think. My first thought was a camera glitch. Facebook? Pinterest? If you have a way of posting this online, you’re welcome to send the link. Thanks! Hey, wildninja. Back in 1983 I went to Never Never Land with my son and my brother. I thought the place was charming, took pictures with my 35 ml Canon camera, and many years later I noticed something strange in one of the photos that I don’t remember seeing at the time I took the photo. Across from the old lady in the shoe display was the woodland elves display, and on one of the trees appear 3 faces up against the dark brown trunk of the tree. The faces are not what you would see on a totem pole, but strange human like. The middle face has what appears to be an upper hairy torso. I scanned the photo and would like you to look at it. I was trying to get pictures of this display from the internet and realized the park has been closed for quite some time. I wanted to compare my photo with perhaps someone elses photo of the same display. Even if they were carved faces in the tree, I think it’s a strange thing to display since it does not go along with the fairy tale theme. I’ve scanned the photo (no photo shop I promise). Thanks for posting your article on on this blog. Do you have a blog? If there’s some way you could post this photo online, I’d like to see it. Please send me the link if there’s a way to do that. Thanks, and thanks so much for stopping by! Oh, that’s because I added Bigfoot to the photo. I didn’t intend for people to think it was real. So it sounds like you have access to a Bigfoot suit? Interesting that you mentioned Mt. St. Helens. There’s an attraction near there (or was) called the Ape Caves where some think Sasquatches lived. If you want to read a book on this subject that will just freak you out, try Frank Peretti’s “Monster.” He’s a Christian writer who is a master of suspense. I just love this funny story. I remember being in the Pacific Northwest when the Sasquash was sighted. We were there the June after Mt. St. Helen erupted there was still ash over everything. We came out of a restaurant and a man was waiting outside selling children’s tee shirts with drawings of Sasquash on the front of the shirts and some slogan that I can’t recall anymore. My children really liked them and wore them out. As children they too were so fascinated with the idea of a Sasquash. Aren’t we all?